Mena is a Breton citizen living in Karthwasten with her husband Enmon. She has a daughter, named Fjotra, who has been taken captive by a group of Forsworn. Mena leads a very simple life at Karthwasten, waking up at 7am and goes to sweep her porch for 12 hours straight until she finally quits at 7pm and heads inside for some relaxation until her bedtime at 12pm. She wears a set of farm clothes, a pair of boots, and a cowl. She is equipped with an iron dagger and carries a key to Enmon's house as well as a selection of lower-class loot and gold. Much like many of the other citizens of Karthwasten, Mena is not too fond of strangers, saying, "Strangers are nothing but trouble." She has little interest in talking and will say, "Ainethach's in charge of Karthwasten. You should bother him." , "What do you want? Can't people leave us alone?" or, "Karthwasten has enough problems. Leave us alone." Asking her about Fjotra will cause her to say, "Oh, I... I'm sorry. I just can't... you'll have to speak to my husband." 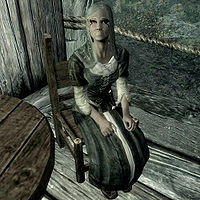 Lash gra-Dushnikh will also mention her and Enmon if asked about Fjotra, "I thought Enmon and Mean [sic] had a little girl, but I haven't seen her in a while." Before stage 70 of The Heart of Dibella, the following 2 scenes might take place. Mena: "But why did they take her? What could they want with our little girl?" Enmon: "I don't know. The guards are out looking for her, now. They'll be back soon." Mena: "You keep saying that. What if she's gone forever? What if they've done something to her?" Mena: "Are you all right, dear?" Enmon: "The house is so... empty, Enmon... and quiet." When you're on stage 70 or afterwards, these 2 different scenes will play instead. Enmon: "Are you all right, dear? I thought I saw a tear in your eye a moment ago." Mena: "Oh, I'm fine, Enmon. I just... I still miss her." Enmon: "I miss her, too, but I'm glad she's safe." Mena: "So am I. I hope she's happy at the temple." Mena: "Enmon, dear, do you have any regrets? About letting her go?" Enmon: "No... no, we did the right thing. The temple will take good care of her, and one day she'll be helping all of Skyrim." Mena: "You're right. She'll be a great Sybil, won't she?" Enmon: "Of course she will. She's our daughter, after all." This page was last modified on 20 August 2018, at 16:04.